Amina Muaddi was fascinated by shoes at a young age, and even used to walk around the house in her mother’s heels as a child. She cites her Middle Eastern heritage and close female friends like Attico’s Gilda Ambrosio and Giorgia Tordini as inspiration. 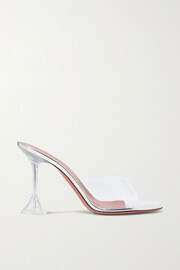 Expect sleek stiletto pumps, boots and sandals with lustrous textures and light-catching embellishments.